More often than not people visit the Yamanashi prefecture with huge anticipation of seeing the most famous of its sights Mt Fuji. It is a very shy beautiful mountain and now that the weather is heating up and the rain season is coming there is a good chance you may not get that postcard image that everyone wants. 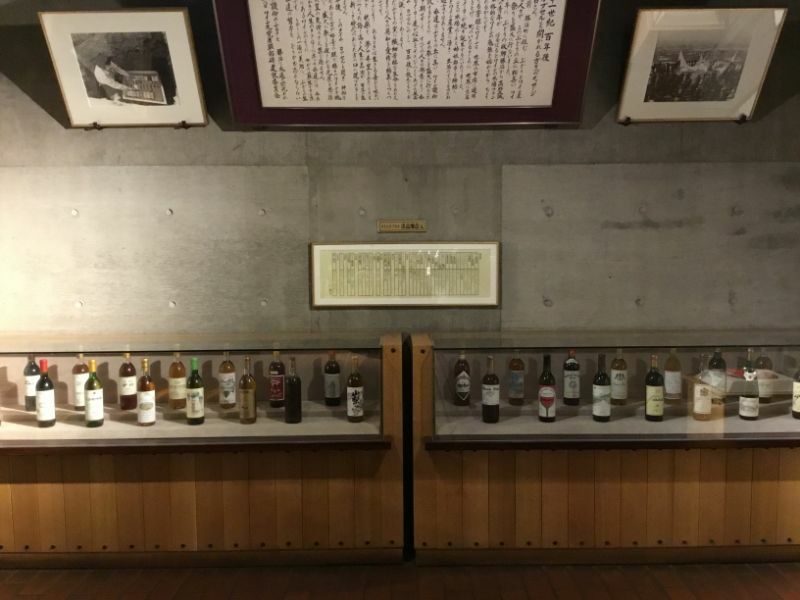 There are however some outstanding wet/ bad weather activities in the Yamanashi prefecture that you may not be aware of and one of them is visiting the Katsunuma wine region. Katsunuma is home to 31 wineries and produces more than ¼ of Japanese wine. Its well known to Japanese wine fanatics and is growing in reputation for overseas wine connoisseurs. 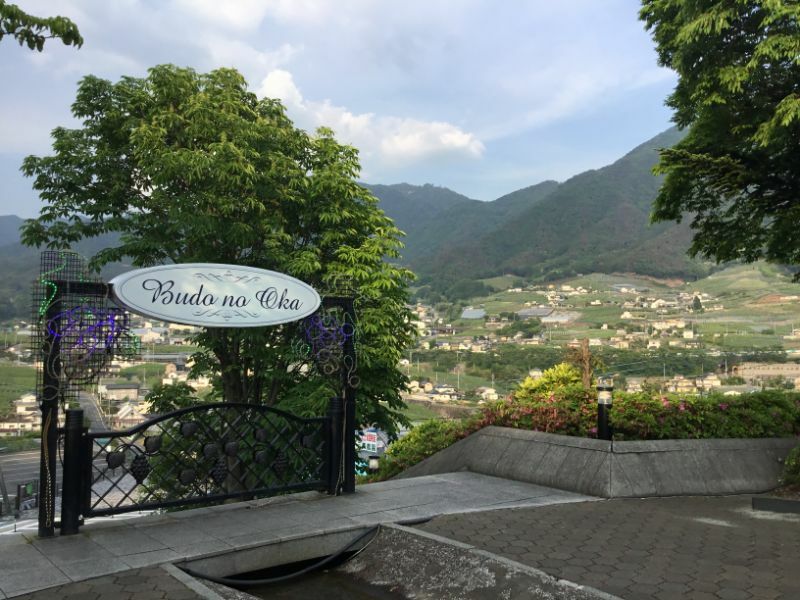 Most wineries are open for the public for viewing, sales and tastings but for someone to gain a quick understanding and find the winery and tastes that suits them I recommend heading to Budo no Oka (Grape Hill). 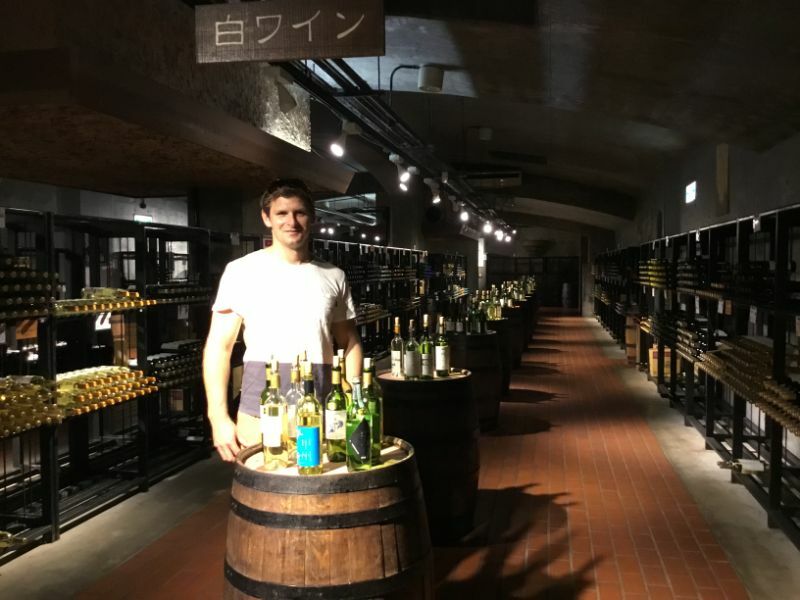 Budo no Oka is the ultimate wine tasting spot where you pay 1100yen to be given a special tasting cup, you are then showed to the huge wine cellar where you can sample 100s of Katsunumas wine. Once you move down the stairs the heat from outside escapes you and the coolness of the wine cave relaxes but also excites you. Most of the year you will have access to 2 rows of 20 barrels each with 7 to 8 bottles of wine to try. During Autumn there are also new season releases, they will open up another hallway to try out all these fresh new varieties. The Atmosphere makes tasting the many wines even that more amazing with low lighting, stone floors and bottles stacked everywhere. 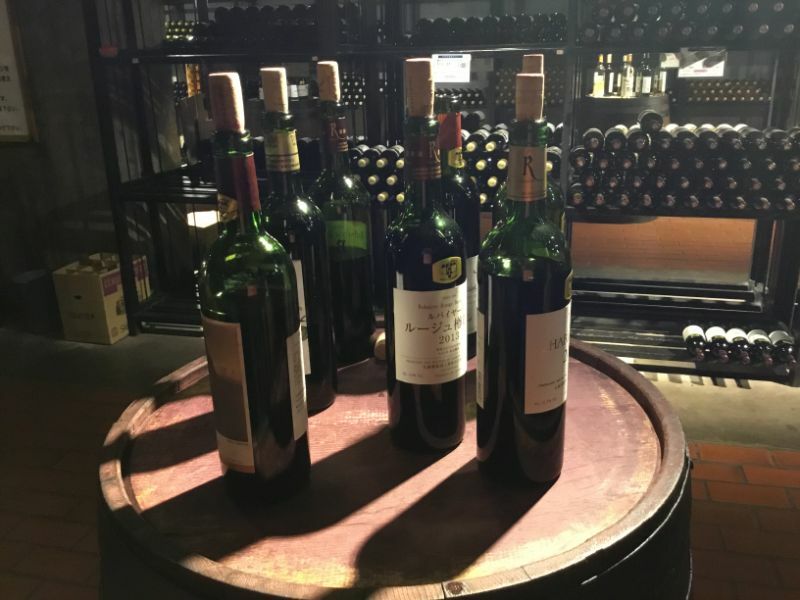 The way that the selection has been set up helps you understand the tastes more as you progress from dry whites to much stronger reds to dessert style extremely sweet wines and if you visit in spring a special cherry blossom wine. On each barrel you will find recommended wines with Gold, silver and bronze stickers showing the awards won. Be sure to mark down your favourites to remember if you want to purchase later on. The first row when you walk in has numerous Koshu grape wines, Koshu grapes are local to the Katsunuma region which are distinctly lighter and sweeter in flavour. This makes these wines very different when trying to compare with other white wines from around the world Some of my favourites were from the Haramo winery which produce new releases each autumn. You can find many of the new releases in the far corner of the cellar. I would recommend you spend more time on these as they work perfectly with Japanese cuisine and are very great warm weather wines. Once you have finished with your tastings, you can head upstairs to the gift shop to buy souvenirs and if you have other wine you want to purchase. You can also ask for maps and directions to the wineries that impressed you in the cellar. Chances are you are hungry, I didn’t try the onsite restaurant but instead took a 10min taxi ride to another famous delicacy of the Yamanashi region, Houtou noodles. One of the most famous restaurants is Minaki, weekends are extremely busy but during the week the waiting time was minimal. The Minaki building was previously a Medical headquarters that has been renovated into a restaurant without losing its authentic Japanese look. It also has a stunning well kept garden that you can enjoy while waiting for your table. 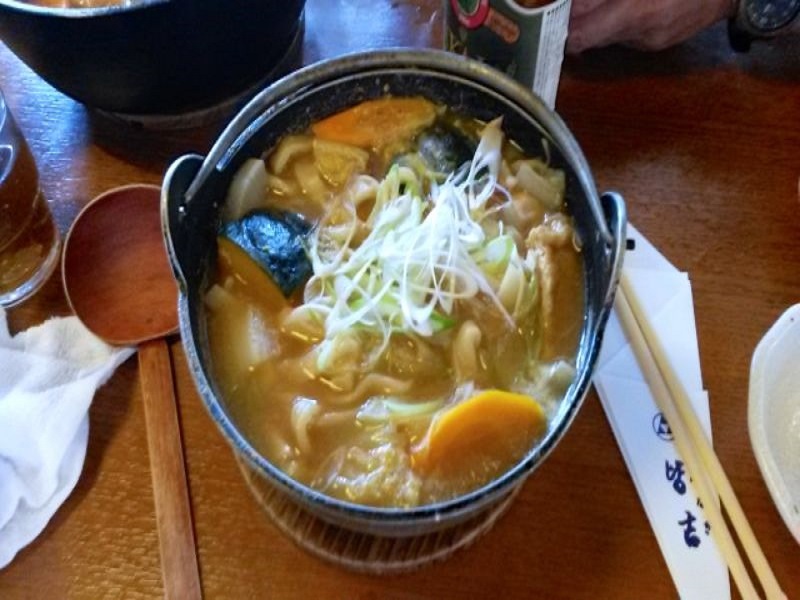 The Houtou noodles are a served in a hot pot with meat, seasonal local vegetable, thick noodles and a miso based broth. The meal is huge and it’s completely normal to share one hot pot. At Minaki you can also enjoy other Yamanashi specialties such as Torimotsu which is Chicken giblets in sweet sauce and Basashi which is thinly sliced raw horse meat that you dip in soy sauce and ginger. Both are much more tasty than they sound and are highly recommended if you visit Minaki. Budo no Oka is definitely a great stepping stone in learning abou Yamanashi wine. Being very close to Tokyo and Mt Fuji, it is an excellent day trip option. The peak season is Autumn when the grape harvest is in full swing but all year round is perfect to visit the home of Japanese wine.